If you are using an existing menu location, simply add a Max Mega Menu Widget to your page and select the relevant menu location. The following steps assume you want to display a brand new mega menu using a widget. Under Mega Menu > Menu Locations, click the “Add another menu location” link and rename the location to something suitable. In our case we’ll rename the location to “Blog Sidebar Menu”. 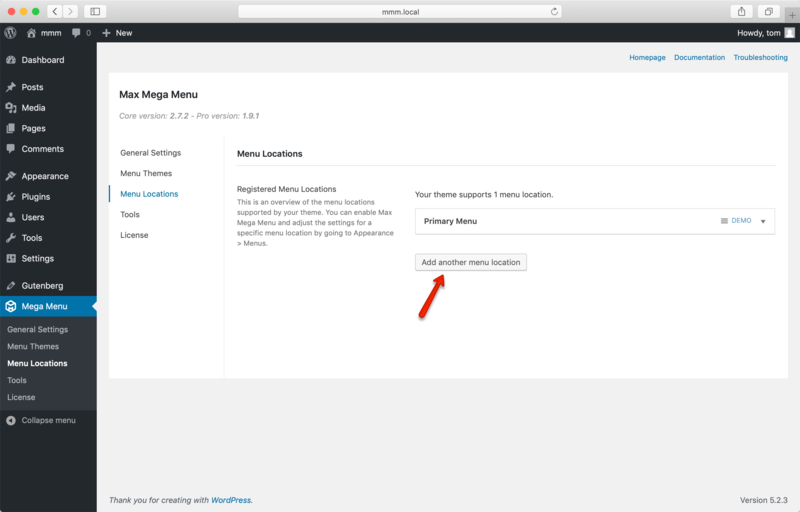 Tip: Advanced users may prefer to register a new menu location using the register_nav_menu function. If you want to display a vertical menu in a sidebar, now is the time to set the “Orientation” (in the Max Mega Menu settings box) to either “Vertical” or “Accordion”. Under Appearance > Widgets, drag the Max Mega Menu widget (not the Navigation Menu widget) to a sidebar and select the new menu location.